The Dragonfly stove takes precision-simmering performance and puts it in a chassis that's built to handle a variety of fuels and the frequent use dished-out by global vagabonds. Tough and stable, it also excels in institutional and guide service settings, easily handling pots up to 10" in diameter. The Dragonfly stove takes precision-simmering performance and puts it in a chassis that&apos;s built to handle a variety of fuels and the frequent use dished-out by global vagabonds. Tough and stable, it also excels in institutional and guide service settings, easily handling pots up to 10" in diameter. Its dual-valve design delivers the flame control you need for simmering sauces, and goes from zero to searing at the twist of a knob for melting snow and brewing-up fast. We pioneered the dual-valve design of the Dragonfly stove, enabling it to deliver precision, simmer-to-boil control. Wide pot supports hold up to 10" maximum diameter pots or fry pans for group cooking. Burns white gas, kerosene, unleaded auto fuel, diesel, and jet fuel. Folds to 1/3 of its working size and fits in a two-liter MSR pot for easy storage. 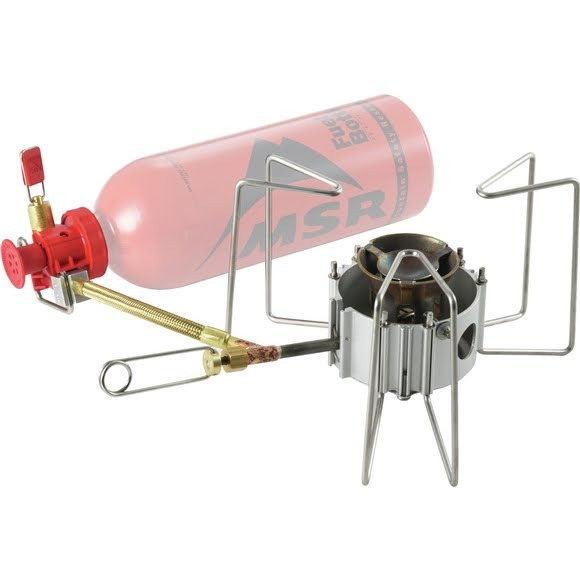 Suspended burner cup enables the stove to burn hot and strong while reducing heat lost to the ground. Shaker Jet™ technology and smart engineering allow complete cleaning and maintenance in the field. Includes : Fuel pump, windscreen, heat reflector, small-parts kit, instructions, and stuff sack.